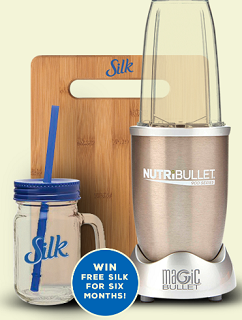 You can enter once a week for your chance to win the Silk Smoothie Solution Kit Sweepstakes! Ends June 12, 2015. (i) a six (6)-month supply of Silk® products in the form of twenty-six (26) coupons, thirteen (13) of which are redeemable for a free half-gallon of Silk® up to $3.99, and thirteen (13) of which are redeemable for a free Silk® dairy-free yogurt alternative product up to $1.49. ARV of each prize: $199.23.